Designed for maximum visibility and convenience, this 1/6 size 6" deep clear polycarbonate food pan is an excellent addition to your business! This container's clear exterior enables you to easily see its contents. Meanwhile, its shattered-resistant polycarbonate material naturally resists food acids and oils to maintain crystal clarity and a long product life. Furthermore, this durable food pan can withstand temperatures of -40 to 210 degrees Fahrenheit for various storage locations. This 2.35 qt. capacity pan with a lid (sold separately) can be added to your refrigerated prep tables or serve as a loose storage bin on your wire shelving. Great plastic pans. Only complaint is the plastic needs to be little more thicker for more durable use. However ours are for fresh veggies and do a great job for the price! Will order again! Thanks! I bought a bunch of these for my small deli case and they are perfect. They are heavy duty and the perfect size for what I need. if you are in the biz you gonna need many of these and the prices here are right. these are the deep ones they have different sizes when it comes to depth. Great construction. The pans stack together perfectly without becoming stuck and are sturdy. The sides are crystal clear so it is easy to see what is inside. We use these in several of our cold stations without any problem. They have been dropped several times and held up without cracking or breaking. Highly recommend this 1/6 food pan 6” deep for restaurant/coffee business. I bought 6 of them for my tea shop. It’s good for everything either dry or liquid product. Affordable price and good quality. These are the most necessary item in any commercial kitchen. These are great for storage as well as using in your prep fridge. Always keep extra lids on hand! These are the food pans I use the most on my make line. The size is perfect for most ingredients. If you have a relatively high rotation topping, I think these are perfect. Nice and sturdy and the mold seems universal, as all the 1/6 pan lids I've bought fit just fine. Great product and sturdy. Fits all the lids that we have and we have a mix of brands so that is a huge plus! Nothing worse than having mis-matches and nothing fits. Cleans easy and doesn't warp in the dish machine like some brands do. I will keep buying these as i need them. Used in my sandwich station, They fit perfect in the upper slots without slippage and they aren’t jammed in so tight they can’t be removed either. I purchased about 2 dozen of these almost two years ago and they are a good product. I haven't had any crackage or chipping. They don't cloud too much after daily washing either. I love this size of pan. We use many of these daily and wash and reuse throughout the day. They are holding up very well. Best storage for all deli area supplies for salads an sandwiches keeps things from holding lots of moisture An very easy to label an keep clean . We use these in our sandwich prep table and it does exactly what it's designed to do. The cost is a fraction of some of the other brands and stores available to us. Great buy! These 1/6 clear food pans are so great to have in the kitchen. you can hold just about anything inside of it. Also great to store sauces. the 1/6 size food pan at 6" deep is great for my refrigerated prep table. Holds a lot of toppings and is easy to clean. I use these daily in my restaurant. They are great, heavy duty plastic. They don't stain easily. I use this to put my marinara sauce in and they hold up well. Absolutely essential part of our salad bar setup. We like to use these deeper ones for stuff we use more of like ranch dressing and shredded cheese. These are really nice food pans, I like how they are clear so you can see whats inside. We put our fresh vegetables in these and it keeps them fresh. They are made strong so they don't break easy if you drop them a few times. These are very easy to clean also. Great Product! Great stackable storage for home chef. If you're trying to get your mise on, I recommend these. They're stackable when not in use, hold a lot of stuff, and can easily be plastic wrapped and stuck in the fridge for storage. Clear pan that doesn't stain no matter what goes inside of it. Durable and hasn't cracked or chipped. Easy to stack and store in a tight area. If you do not have much space get this 1/6 food pan 6" deep. It is small and compact bus is so deep that holds good quantity of your ingredients. These 6th clear food pans crack easily from normal use, which is not good when you are storing liquids :(But hey are inexpensive enough to replace as needed. The 6" Food Pans are made very solid and with good quality materials. I like it being clear so I can see from the sides. I definitely recommend this item for use on any food line. This is a great product, very heavy duty plastic construction, easy to wash and store. We use these for a cold deli bar but we also heat up soup in the microwave with no problems. The plastic is very thick and resistant, to scratches, and drops. it fits perfectly with the 1/6 lid, and easy to clean. I use it to store sushi sauces. These 1/6 pans have held up great even with steady, daily use over 6-7 months. So convenient for keeping prepped food stored in the fridge or in the refrigerated prep table. Very Good product for the price, No complains here. They might not last as long as some quality brands but they are only 1/3 the price So it a good deal. This is a very good economical container. I Have dozens of them. They hold lots of product and stack nicely when not in use. Be careful because they can crack if dropped too many times. I am very sure any restaurant industry using this kind food pan for prep table. It is very good quality and clear looking pan. I bought this alot for our restaurant. Nice deep ploycarbonate food pan. We appreciate how sturdy it is to hold heavy foods and thaw out frozen items. Its very easy to clean. This pan is very useful for a number of things. We use it to hold water when preparing our recipes. We have also used these pans to hold spoons. The 1/6th size food pan gets the most use at our coffee shop in our prep table. Even with the amount of use and washing they have held up great for almost 2 years now. We got these in various sizes for storage. These are lightweight yet durable. Easy to clean and the see through design makes it easy to tell what is in there. Definitely recommend. Apparently this product can only be giving a high review. Third times a charm. Good strong container, just make sure it's not shipped without plastic & sharp items placed inside. Also when you get a replacement, don't be bothered by a crack on the side. container is 2 1/2 quart like stated & it is from Rubbermaid. Great numbers on the outside. I bought 14 of this and I love them! The price and the quality are great, and I also like how deep they are! They fit a lot of ingredients ! Really recommended! These are perfect for any makeline. They allow you to store a decent amount of food, while remaining an efficient use of space. The containers are also easy to flip and clean. Great Product , we are so happy with these containers , great value , we bought lot of them and we will buy more . we highly recommend them . We use these pans to store our tomatoes in our prep tables. The plastic removes the risk of acidic foods from taking on a metallic taste. They work great for all foods hot or cold. wow, these are perfect for prep tables, salad bars, ingredient storage, and a wide range of other food prep tasks, this clear food pan makes it easy to store and serve cold foods. Very strong and durable. Perfect pans for our refrigerated prep table. Dishwasher safe so cleaning is very easy. Great price compared to other websites we have looked at. Our convenience store has a deli and grill with a cold prep table. We use these 6 inch deep food pans in the cold prep table to store our condiment squeeze bottles. They are the perfect size to hold several large bottles or a day's supply of cut up vegetables for sandwiches. High quality plastic and easy to clean. These are well made and fit our sandwich bar perfectly. Nothing seems to stain them and we have put just about every kind of cold food in them. Very good pans. They stack and store easily. Very light, durable and extremely easy to clean. The quality is very good at an excellent price. These work great and do good for storage options, but we were trying to use them for service and the highly repetitive use took a toll on the plastics integrity quickly. If you are just looking to use them to store things they may work better. These food pans have held up over a year in our restaurant. We have been very pleased with the quality and can't beat the price. This clear container is so much useful. We always order with the lids. The efficiency will be better when they work together. I will buy it again. We love our smaller six inch deep plastic pans. We use them for food storage primarily. But we occasionally use them to hold cleaning products. We use these every day for our cold table toppings. Scratch and shatter resistant. We bought a dozen of them to get the quantity discount. Love that there are measuring notches, too. I bought this product to compare with the Cambro pan, as the Cambro is twice the price. Thus far, it seems to be holding up well and I will probably purchase this in the future. Used this brand for a long time. Hasn't yellowed or discoloration or anything like that. Works great for all our needs on the line. Very economical as well. This 1/6 size 6-inch deep clear polycarbonate food pan will store about 10 cups of food. It will keep the store food fresher, longer. Get the matching lid as well for an airtight storage. The 6 inch deep pans are what we use for some of our more popular toppings. The pans are easy to clean and keep everything nice and cold. Theses deep 6 pans are great. They withstand numerous washes and continue to look new. They stack great and are good with hot or cold product. Works well. Looks good and the clear color has not browned or diminished after 2 years of daily. Stacks well when empty, and also when the lids are on. Good product. We prefer these six inch deep pans over the four inch pans because they hold more and fit into the sandwich cart easily without sacrificing undercounter space. This pan is perfect for storing items. There is a matching lid you also buy. When not in use the bins all stack inside each other for easy storage. Good sturdy bin and they don't discolor or yellow like some of the other plastic bins. They fit well in the standard salad prep stations as well. Excellent poly container that has been durable for four months with no signs of discoloration, chipping or warping. These are perfect for cold stacking storage. So far, we are just using one of these to hold our smaller cooking utensils such as measuring spoons, small tongs, can opener, rice paddle, etc. works great. Going to buy a less deep version and a lid so I can store cut lemons on ice to place next to our iced tea dispenser. Durable item that meets high volume demand. We use these throughout two restaurants and haven't had an issue. They are dishwasher and cooler safe. Will buy again. Great pans! Still have yet to break one. This is made of really strong polycarbonate that really hold up to the harsh elements of my kitchen. Very durable and I love the fact that the clear container allows you to see the product unlike the solid black containers. Definitely 5 stars! This food pan definitely exceeded my expectations. The price is very reasonable and the quality is excellent. I would highly recommend this product. I am giving this item a 5 star rating. I purchased the container for refrigerator storage. The price on these is great, at least 1/2 if not more than the name brand food pans. Holds up great, no difference from name brand. Rounded corners are nice and all of my other different brand lids fit these. What a great price for theses. I shopped around and by far webstaurant was below every other place that I looked at . They are very durable as well. These lexans are perfect, I have bought many and they work great! Glad I found them and the price is rare to find, so cheap! We use these in all different sizes in our prep fridge and love them! They stack easily and don't really scratch at all. Great pans! Can't beat the price and they perform as well as the name brands. Cooks can be rough and the corners will crack, but so do the more expensive pans. Recommended! This is your standard, clear, poly-carbonate six pan. You will not be surprised when this arrives, The quality is nice and so is the price. It would have been nice if the deli prep refrigerator already came with these guys, especially with the price I paid, but they will serve their intended purpose. Overall, I am ok with this item. I needed containers to store sliced vegetables and condiments before parties. This container worked out great. After storing sliced veggies overnight, this container helped the veggies keep their integrity. These containers are great for prepping food, They are clear so you can easily see what is in them without taking the lids off. They are great for storing food in the refrigerator not the freezer. We got this food pan at an excellent price! Much less than what the local wholesale store was selling it for, and there doesn't seem to be any difference beside the price. I love this item. It is good for me to put lemons it! And it looks so pretty with the lemons sitting in it. ! These are uwsome for putting ice cream toppings in like mini m and m's, nuts, sprinkles , chocolate chips and many other toppings. The see thru containers make it easier to see whats in the containers. There is no more opening up all our containers Its a great investment for a ice cream shop. these 1/6 sized pans are great for sandwich or pizza prep stations. They wash really well in a high temp dish washer. Get a ton because once you use them you'll do away with your metal bins. These are the lowest price food pans I have found. They are just as nice as any other brand. I highly recommend stocking up on these in all different sizes. This containers keeps my fridge really organize, i love the way it looks, it not messy, keeps everything in place and also really easy to clean. Order three times the amount you think you are going to use, you'll use them. So much cheaper than the prices at my local restaurant supply store. These food pans are sturdy and dependable. For very high volume use, they will crack over time. However, in our small cafe they work perfectly. Plastic wrap adheres really well to them, which is helpful. Recommended! The price of this pan is what makes it a buy! You can not find these for this great of a price any where else. Great size containers for food wells when you need a little bit more of an item in the wells. Easy to clean and optional tops are available to cover. Very nice pans. Stacks and stores easily. Very durable and easy to clean. Love the price for the quality. Will be using this product more. We were in dier need of 1/6 pans, I looked at our local retailers and there pieces were of the charts. I did some research online and found this being my best price with the best reviews. They were delivered fast and they're awesome best deal for money. These work great for cold items. Easy to stack, clean, use all the time. Used in prep tables and used to freeze items in. They are very stain resistant. Very durable and easy to see how much product is left because of its transparency. Great for the food prep line for storing non hot items. Cheapest price around even factoring in shipping.. Its durable too... They end up breaking eventually... but too good at this price... 1/6 SIZE is OK... but once you grow a little... These containers will end up being used for sauces only. well made product very durable. easy to use fits well with the containers. easy to stack and store on a shelf or in the refrigerator. work great for storage or refrigeration, hot or cold. Great pans for the pizza and sandwich prep tables. We also use them for cold items on the self serve salad bar. They look nice and are easily cleaned in the dish machine. These are great for the self serve salad bar and prep tables. They can go in the dishwasher and do not stain easily. 6" is a good size for items that move quickly. Very good item. This is constructed very well with high quality plastic. Holds up well under heavy use. We will purchase this item again when it needs to be replaced. These pans are great for portioning and storage. They are very deep and can hold a decent amount of food. I also like that they are cheaper than the metal and can withstand temperature changes. I am in receipt of the 1/6 size 6" deep clear polycarbonate food pan. It is made of a tough clear material. It works well with smaller items, and is able to hold a good amount of food. It is easy to handle, easy to clean, and is breakage/ shatter resistant. These 1/6 pans really get the job done. Very durable and great for storing back up items and use on the line. Being clear is great also in helping know exactly what you have left. Finally it's the worlds cheapest costing 1/6 pan with quality that's nearly the same as way more expensive ones. Better to get a load of these then you can buy a lot of extra ones with the saved $! These polycarbonate 1/6 size clear food pans are nice & heavy. They work out well for veggies on our salad bar and clean up easily. Again love these. Makes so much easier for proper food rotation. also makes nice storage for when you have just those small items and very sturdy. These 1/6 Clear Food pans are wonderful.. They are dishwasher safe, as well as freezer safe. They fit perfectly in the steam table without fuss. Great little food pan. We use these to display our fresh fruits and fixings at our smoothie bar. Not much to them but they are strong and sturdy. For the price I was expecting these pans to be poor quality. I was pleasantly surprised to find then much better. Clear and strong so far. I'm using this everyday for holding my cut up vegetables during prep in the morning. Holds a lot and with the lid, keeps my produce fresh. Cleans well. This pan is great for all types of foods and what I love most about is you can clearly see the product you have stored inside it, and makes for quick inspections. Great product! I use these for my veggies! I would recommend this product to every body! Keeps my veggies cool just like I need them. I love these 1/6 pans for prep on our cold table. They're very sturdy and are clear so you can easily see what's in each one. They work great for chopped veggies and salad mix on our service line. Sturdy food storage pan. Doesn't stain easily. Great for holding ingredients for a salad bar or something similar. I also appreciate the square shape of the containers rather than rounds as it makes the storage of them (in the fridge or on the line) much easier/more efficient use of space. Great product for the price. I bought a dozen for my new sandwich cooler and they're great. I prefer plastic over the metal as they fit better. These 1/6 size clear food pans are really a perfect fit for our food truck. They Work great in our sandwhich prep table. They are Very durable ! I like keeping these at home and my food trailer. Nice container, well built, and good price. I recommend keeping some on hand. Good buy. My husband and I recently purchased a pizza restaurant and we were badly in need of more 1/6 bins. These are so perfect, durable, and fit our needs perfectly for our sliced vegetables and other pizza toppings. Thank you! You could use the super expensive name brand one or you can buy this one, i normally say you get what you pay for but in this case the cheaper one works well. Average product. Not especially good or bad, but... It tends to break more easily than a translucent product I bought on here. Otherwise it works fine. These are great containers. Durable, and you can see the product inside of them. they can be run through the dish machine no problem and stack well unlike most metal ones. Great quality as usual and stackable meaning easy to store away if unused. We use these for marinades, oil and sauces and hook on a carlilse boar hair brush when in use. It's not cheap plastic as price. Quality is great. If you need many of them buy from here will save you a lot. This is a good deal. Good quality and good price. Will order more when I need them. Make sure to order in bulk to receive the best deal for shipping. I use these everyday, and i am very happy with the product. They are made of thick plastic, and can hold up to hot liquid as well. The pricing for this container is good! The quality is great and I use these for everything! The lids that go with them are good too. A great food pan at an even better price. They were packaged well for shipping and received with no cracks or physical damage. Thank you Webstaurant Store for quality products at great prices. use these for mise en place on all kitchenm stations. a must have along with lids. use in salad bar as they are stackable for backups. The polycarbonate 1/6 size food pan is a must have for holding just about anything in your prep units. Very easy to clean and see whats in it. The best priced, most versatile small-ware we have in our kitchen. We use these everywhere and get bummed when we run out. Can never have enough of these. So far, I have bought both the 1/6 and 1/3 pans and have been impressed with both. They have held up well, and since they aren't the amber, (clear is cold for those who don't know), the price is way too good to pass up. My wife and I are already discussing ordering about half a dozen more. Great quality pans, every bit as good as the name brand pans we have used in the past. We will never spend the big bucks on name brands again as long as these are available. We are happy with these food pans. They are easy to stack. They are easy to clean. We use them daily. We would recommend them. 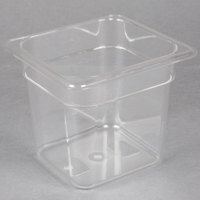 We use these containers along with the clear lids for catering purposes. They are the perfect size/depth and allow us to easily see what is inside each container with a quick glance. The 1/6 hotel pan in Clear Polycarbonate and 6" deep is exactly what we needed. The selection at Webstarauntstore.com is really great and they have every size we could want. This is your standard plastic 1/6th pan. Cleans great, holds food like it should. It hasn't broken or scratched yet which is a plus. I will buy again! We buy a lot of these as they are a very good choice and much cheaper than the Cambro brand, if you work on a cost budget these are the ticket. Can never have enough of these guys. We use them for our sub and pizza prep tables and to store backups in the walk in cooler. We have had the 6" deep pan for about a month now and have not any problems. Durable and good quality pan that washes well. Prior to these we were using tupperware and we're happy we switched. Now our kitchen looks more professional in every sense. Durability is not a problem as well, we've dropped these many times in the past and not a crack. Will purchase more when the need arise! Great container for us so far. Very sturdy. It does what you would expect it to do. For the price and the quality it definitely deserves five stars! A great option for keeping soups stocked in case there is a shortage. easy to transport and very heavy duty. 60% less than most restaurant retailers charge you. Seriously, the best 6" deep pans you can buy. Crystal clear, stackable, thick and microwavable. These 1/6 pan are perfect. I bought an additional dozen to throw out the old plastic ones we had been using. Buy the lids too, they are awesome as well. We bought loads of these here and of course use them all the time. They are sturdy - I mean they don't break when you drop them on the tile floor! I absolutely recommend for dry storae products. Prepping and food storage is so much easier to organize and manage different ingredients. Also use for other utensils. The plastic sixth pans are perfect storage containers. They stack up easily on the shelf when not in use. Also they fit into coolers perfectly. Amazing product and great price. We use them and there lids to store meany things and make pickles in them. Fabulous heavy-duty container. also great to keep things hot. Once again. The lowest prices on the web. Webstaurants save my business so much money! I just wish i had found this when i first opened my business. The pans have held up fine and the corners done chip like our old ones. These are the perfect containers for salad prep! Clear plastic allows you to easily check the quality of all the ingredients in the container! Very durable!! I agree with others...great pricing compared to other supply places, and I love these in all the sizes that I use! The 6" deep one holds my deli meat perfectly. This was a great buy. It helps out in the beginning of the day prepairing food for the store. Great size that can be easy to store and keep in order. Great Food service regular temp pan. Im always asked where i get these from. So i tell them and they end up here buying 30 more things they really needed but always thought prices were high. This is an excellent 1/6 pan. They not only hold up well to cold temps but hold up well in mid temps as well. Great price too. I purchased a few of these bowls here at Webstaurant Store because of their prices. These bowls are quite sturdy and have kept whatever I store in them quite fresh. A great sized pan. The six inch depth makes it very versatile and it is easy to clean and holds up well under daily use. These work great! We put everything from sandwich meat to vegetables in them. They also have a nice little add on that you can buy for them that goes in the bottom to keep stuff from getting soggy. The 1/6 Size Food Pan 6" Deep is an economical versatile piece. I use it not only for storage of cookie doughs, frostings, sauces, etc., but also for displaying small salads for customer purchase. They work great thanks to their durability and clear sides for product viewing. They even work for softening butter in the microwave!